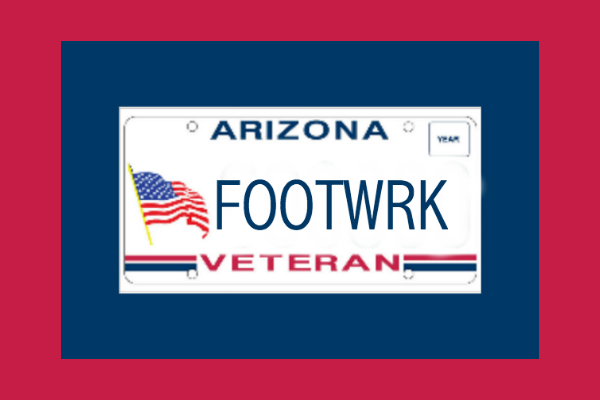 We cherish our Veterans here at FooteWork, a Veteran-owned family business, with four offices serving Northern Arizona. There are special benefits like Veteran designation, tax and fee breaks, and special plates that apply only to Veterans. If you have served our great Country, make sure you’re not missing out! Arizona House Bill 2428, which became effective in September 2013, allows Veterans the option to have the VETERAN designation on their Arizona-issued driver license, commercial driver license, identification card or learner permit denoting their military service. A Veteran Designation on an Arizona driver license, instruction permit or identification card is available to U.S. military veterans or active duty service members. The word “VETERAN” will be printed on the front of the license/permit/ID in blue lettering. Those who would like the designation should fill out the Arizona Driver License/Identification Card application (online form) or Commercial Driver License application (40-5124) and check the Veteran Designation box. This application should be brought to an MVD office or authorized third party office, like FooteWork, of Prescott, Prescott Valley, and Cottonwood, that processes driver license transactions, along with veteran designation documentation. Initial applications must be received in person and will require a new photo. Once on the customer record, a duplicate can be ordered and it will have the VETERAN designation. Original Statement of Honorable Service from the Department of Veteran Affairs or Arizona Department of Veteran’s Services. If applying for or renewing an exemption, the registration renewal must be made by mail or in person at an MVD or Authorized Third Party office like FooteWork of Prescott, Prescott Valley, Cottonwood, and Williams. A member of the U.S. Armed Forces regular component, reserve component or National Guard. A spouse, surviving spouse or legally designated representative may request an exemption on behalf of a qualifying owner/lessee who is serving on active duty, who remains listed as missing in action, or who died while serving on active duty. The date of death must be in the current or previous registration year. The applicant must ensure all other registration requirements are met and submit a completed Special Military Exemption form and military orders at the time of registration. Note: Qualified individuals who already paid vehicle license tax and registration fees while eligible for the exemption are not entitled to a refund but may apply for the exemption at the next registration renewal. A veteran owning or co-owning a vehicle is exempt from payment of vehicle license tax or registration fee, if the veteran is certified by the Department of Veterans Affairs to be 100 percent disabled and drawing compensation on that basis. The exemption also applies to the surviving spouse, until remarriage, and to only one vehicle or any replacement of the vehicle owned by the veteran or the surviving spouse. A veteran residing in Arizona is exempt from payment of vehicle license tax or registration fee for a vehicle or a replacement vehicle acquired by financial aid from the Department of Veterans Affairs. 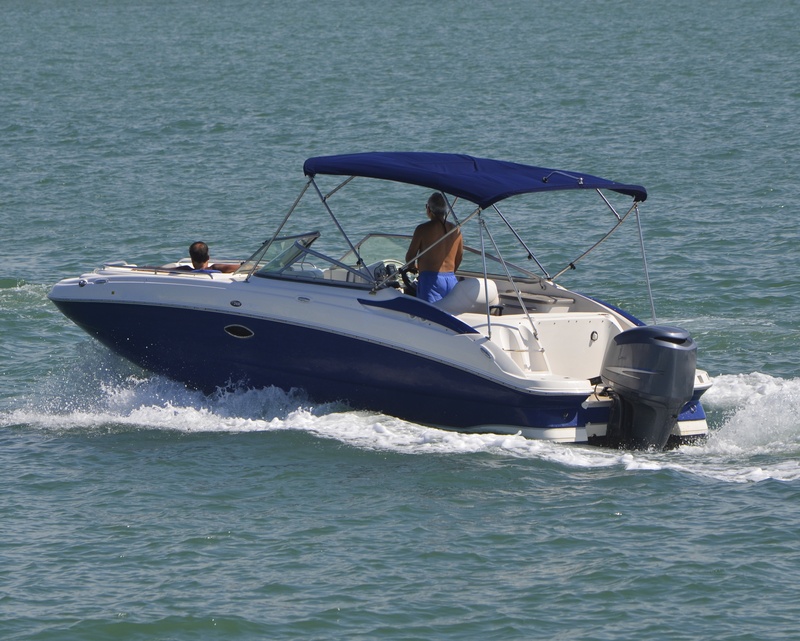 The exemption applies to only one vehicle or any replacement of the vehicle owned by the veteran. Active-duty military personnel or public health service (PHS) officers stationed in Arizona who are not Arizona residents are exempt from paying the vehicle license tax portion of the annual vehicle registration. provide either an affidavit for vehicle license tax exemption of nonresident service personnel issued and certified by the commanding officer or a military Leave and Earnings Statement (LES). meet all applicable vehicle emissions test requirements. 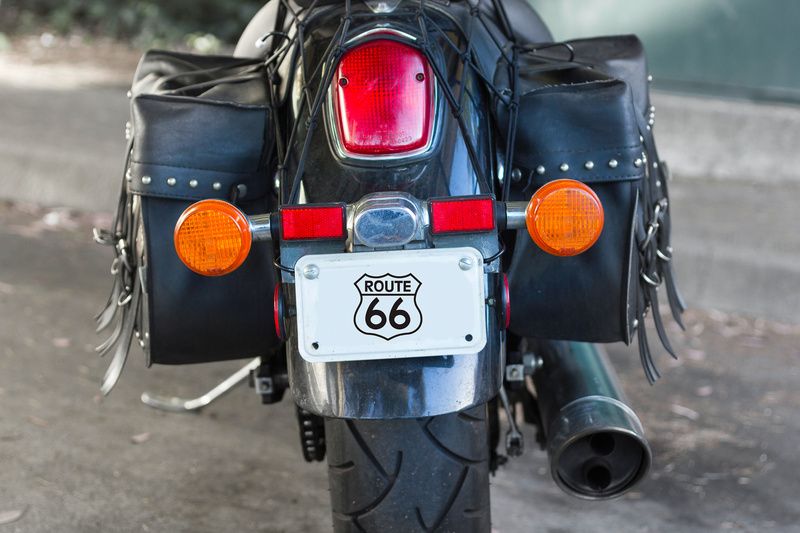 pay a registration fee and if applicable, commercial registration and weight fees, motor carrier fees and/or any late registration penalty fees that may apply. 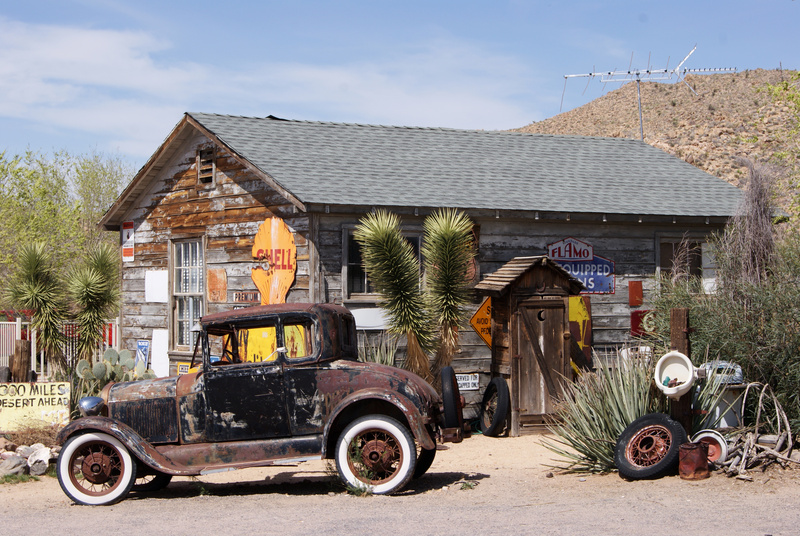 When the nonresident service member is assigned overseas and the spouse or dependent must remain in Arizona, the exemption still applies if the nonresident service person was on military assignment in Arizona at the time the overseas orders were issued. By law, the Arizona Veterans Donation Fund is used only for Arizona’s veteran programs and cannot be absorbed into the state’s general fund. All-in Costs to You: $25 initial application fee, plus $25 annual renewal (no renewal fee for personalization of a veteran plate), in addition to all applicable vehicle licensing and registration fees. Applicant Must be A Veteran: You must provide a copy of the appropriate form as proof: a DD214, 215, 2A, 2 (retired), 2 (reserve) or 1173; or provide an original statement of honorable service from the U.S. Department of Veterans Affairs or the Arizona Department of Veterans’ Services (ADVS). 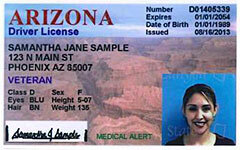 For more details on what identification is accepted by the Arizona MVD, please review the Questions & Answers at the bottom of this page. Your Veterans Plate may be personalized for an additional $25. Veteran Plates may also be issued to the spouse, parent, child, brother, or sister of an eligible person who has been issued this plate. 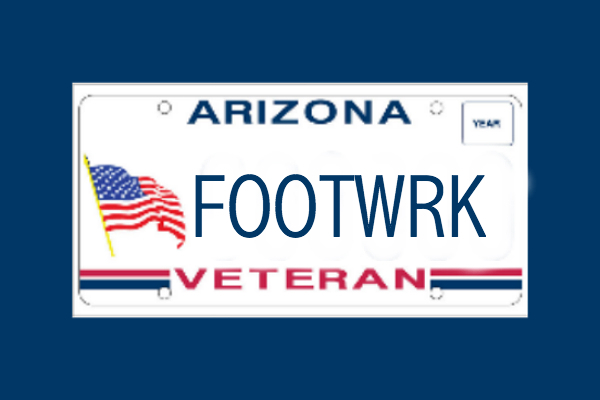 FooteWork is a Veteran-owned family business that has been serving Northern Arizona for 20 Years.  We have the forms and our friendly staff to help you through the process. If you are a Veteran, come see us at one of our four offices!